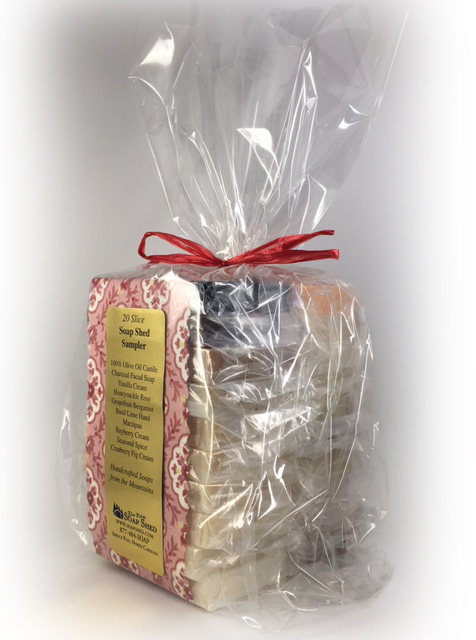 Our Soap Shed Sampler contains twenty 1.5 ounce slices of soap! Ten of our best selling scents, as included in the Top 10 Sampler, one each of Fresh Mountain Air, Kitchen Cook Scrub Soap, Mountain Morning Wake Up Call, Oatmeal Milk & Honey, Cobbler Spice Cream, Lavender Cream, Stud Bubbles, Sweet Lemongrass, and Mountain Herb and Jasmine Appalachian Crafter's Hand Repair. And it only gets better with ten more bars including 100% Olive Oil Castile Soap, Charcoal Facial Soap, Vanilla Cream, Honeysuckle Rose Cream, Grapefruit Bergamot Shea Facial, Basil Lime Hand Repair and four seasonal scents, which will vary throughout the year. This Christmas, we're including Marzipan, Bayberry Cream, Seasonal Spice, and Cranberry Fig Cream. Each soap is individually wrapped separately from the others and labeled so that you, or whomever will be receiving your gift, will know exactly 'which soap is which' as you try each bar. The bars are then wrapped together in a colorful strip of fabric and enclosed again with a decorative cellophane bag and gold foil label. In the Soap Shed Sampler, there are two fabric enclosed groups of ten soaps slices each, placed back to back in the large cellophane bag. Each sample slice is approximately 1.5 ounces in weight. Minimum weight of this gift is two pounds, or 10 full size bars of our soap. We reserve the right to substitute as needed, especially during the busy holiday season, while still keeping to the 'theme' of this Sampler - providing a variety of our best selling soaps. Soaps in this Sampler will include Olive, Coconut, Palm and Castor Oils, Shea Butter, Cocoa Butter, lard, Sodium Hydroxide (Lye), Mountain Spring Water, Goat Milk, herbs and botanicals, fragrances.